Ambulances are often used for the transport of sick or injured persons to or from a treatment facility such as a hospital. 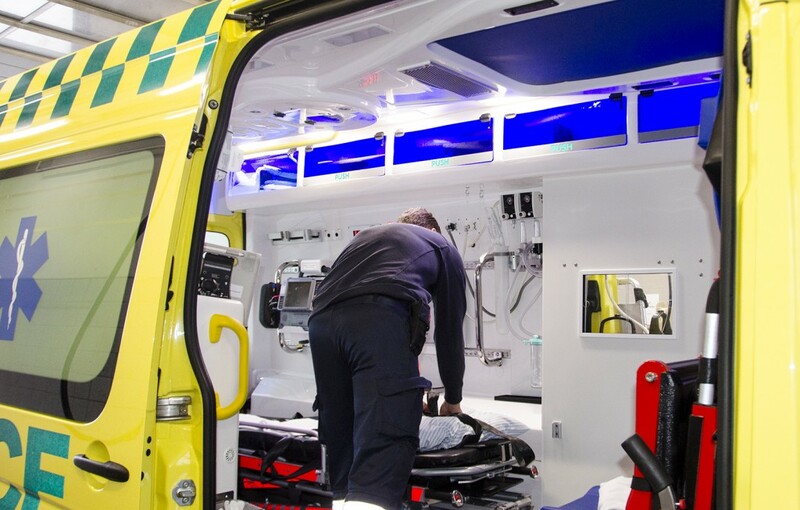 Both the interior and the type of transport can vary from country to country, as well as concept of transportation by ambulance concept may cover many different transport options – both acute and non-acute tasks. For complicated transports of patients in critical condition between hospitals, it may be necessary to use special ambulances capable of handling hospital beds or incubators for babies. In ambulances music intervention is used to make the transport of patients to and from the treatment as comfortable as possible. Studies show that patients who receive music intervention during transport experience reduced anxiety and stress during the transport. This allows for better treatment of the patient. Ambulance transport is often an extremely stressful situation for the patient, who may additionally be in a critical condition. Fast driving and noise from the instruments and siren affect the patient adversely. Music intervention can counter this situation by shielding of ambient noise and allow the patient to focus on something positive. In ambulances it’s recommended that music intervention as a starting point is given to all patients. After 10-20 minutes of intervention a short break is typically provided and the patient may possibly be asked about continuing the music intervention. Speakers for music intervention are typically installed in the ambulance ceiling just above the headboard. With permanently installed equipment music intervention is always ready for action and can be initiated at the touch of the control panel. AudioCura is focused on the use of music in the treatment and care of patients in healthcare. To make music intervention practically applicable AudioCura has developed a range of products that fit into the workflow and hygiene in healthcare and, not least, that give the right response to therapy with music.